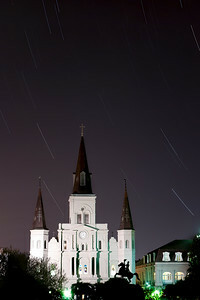 Light trails flying high above the St. Louis Cathedral in Jackson Square, New Orleans, 2011. 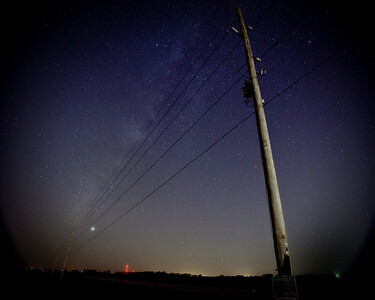 Lots of light pollution in this part of the city, so very difficult to capture all of the stars that were up there. 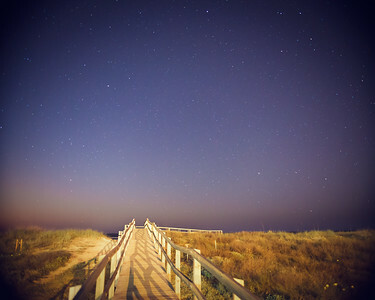 Tis is actually a photo manipulation. 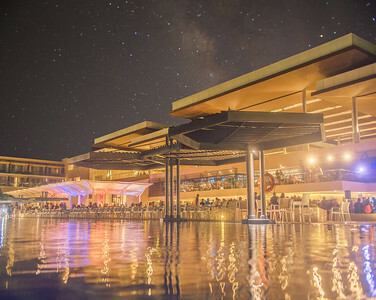 I took the Milky Way shot just slightly arrest of this hotel, looking in the same direction at about ten minutes earlier. T's not a sky that could actually be seen above the Royalton in Cancun, from within he hotel grounds. 2016. 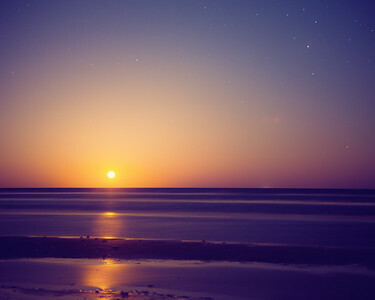 Not a sunrise, but a moonrise - one which actually took me by surprise, but was an awesome sight just figuring out what was going on as the sky became every brighter in the dead of night. 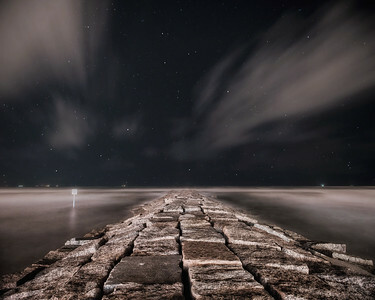 Gulf of Mexico at night, Galveston Island, 2014. Just a simple star field, but an impressive one, looking out over the dunes at the Galveston Island State Park in the spring of 2014, Texas. 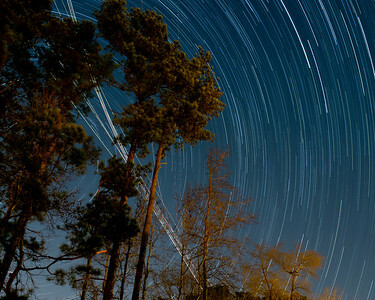 This is one of my favorite star trails shots - it was taken under a glorious clear nigh5 sky in suburban Atlanta. What really made it was that the light trails were competing for attention with the tracks of various airliners not he approach into Atlanta Airport, New Year's Eve 2011. 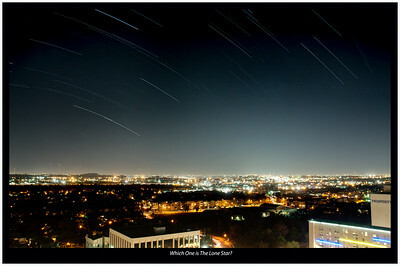 A series of star trails, taken from the 20th floor of hotel in uptown Houston, looking south towards US 59 (the South West freeway), 2011. 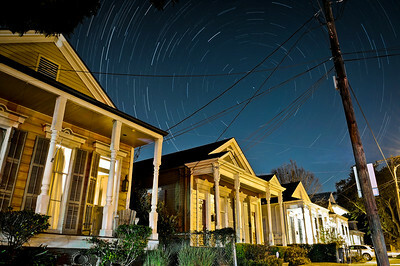 A combination of North Star light trails and the Henry Clay shotguns in uptown New Orleans, 2011. 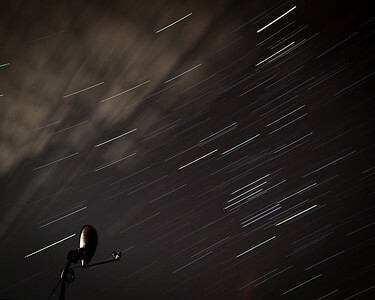 This was actually one of my first forays into long exposure photography of the stars. I've visited Galveston Island often and I always wanted to get this shot. This was taken close to midnight; the wind was up and it generated these nice moving clouds. Another interesting aspect of the Gulf of Mexico at night is that you can see the community of ships anchored offshore waiting for the call to me in. 2013. 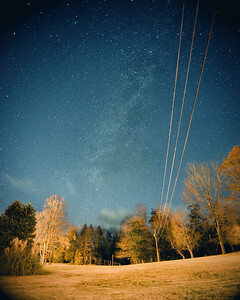 I'll try and try to get the Milky Way "out of season", and eventually I'll get it. This attempt lit top the sky above North Carolina, 2016.